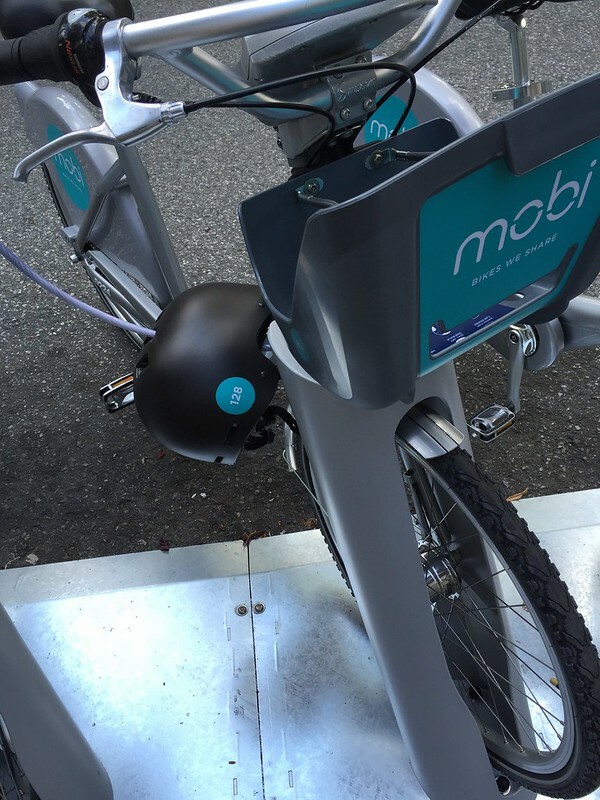 It has been a very long time in gestation, with at least one false start, but today was the first day of operation of Mobi, Vancouver’s bike share system. Ever since I used Velib (seen above), the system in Paris, I have been waiting for one to start here. I have also used systems in New York and Denver. This is the station on Bute at Robson: two parking meters have been suspended until the end of the year to accommodate the station. Presumably, this is to allow for some assessment of need and the potential exists for the station to moved and the meters restored. Because we are in BC every bike rider has to have a helmet – and you can see how they are currently padlocked to the bike. 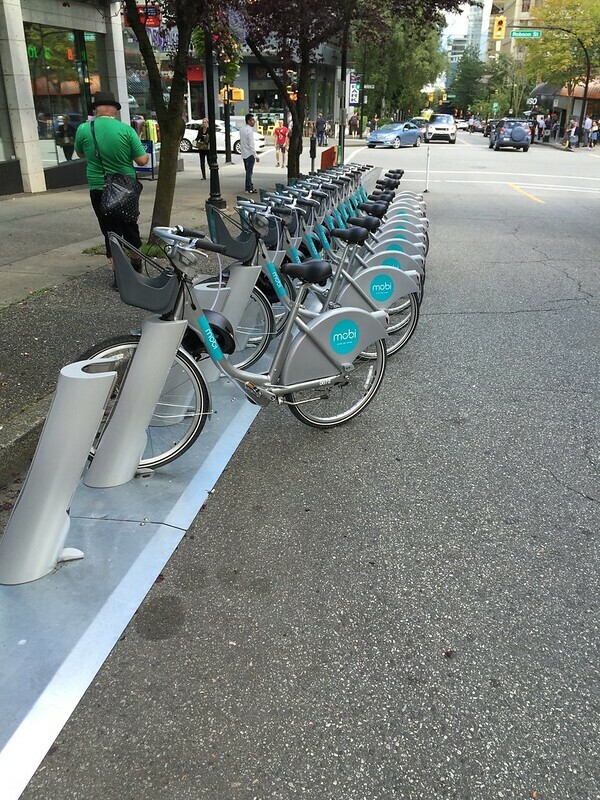 In other places where helmets are mandatory, bike shares have been unsuccessful. Vancouver hopes this time it will be different. Of course our brain dead provincial government could not conceive of the possibility that its helmet law is based on falsehoods, and refuses to reconsider it in the light of current knowledge and, yes, data. The current offer is for an unlimited number of rides for a year – and there is a discounted price for early adopters that ends at the end of July. It is not an offer that I feel inclined to accept. Nor does my partner. As I mentioned I have tried other systems, and none of them required a significant upfront investment from the user. Usually a credit card was necessary as a deposit in case of an unreturned bike, but the ride itself was cheap or even free. There were significant sponsorships on all of the bike share systems that I have seen. Barclays Bank had their name all over the bikes in London: even so everyone calls them Boris Bikes. Here the city has made the up front investment – and I do understand that experience elsewhere has shown that bike shares that actually work reliably do not come cheap. Whatever the model was in Rome, for instance, that didn’t work. The home zone does not extend south of 16th on Arbutus, so it doesn’t actually get close enough to me. A bit like Modo, whose nearest car to my front door is in Kerrisdale. So that’s another mobility aid that is out of my reach. 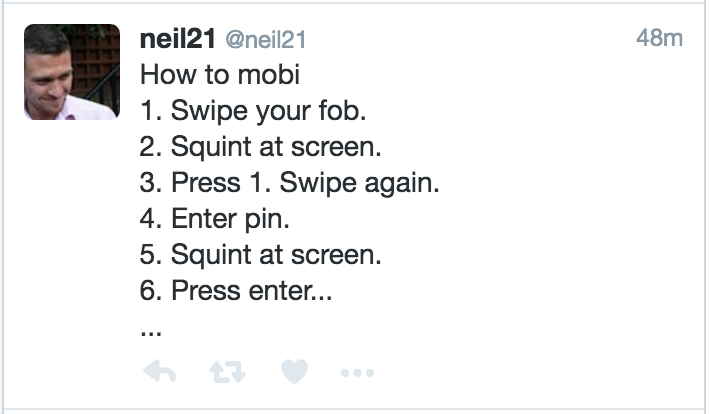 I also know that there has been significant lobbying by the established bike rental operators that Mobi not cut into their business, and the current pricing structure is clearly a real deterrent to use by visitors. Which is a shame, I think, but I can understand how the people who rent out bikes feel. So I will watch what happens with a sense of detached interest. And will watch for the comments of the readers to see if they like the deal better than we do!